1. Running is one of my favorite ways to explore a town or city. Last weekend I was in Dallas for a girls' weekend with a couple of friends (a fantastic, relaxing, food-and-good-conversation-filled weekend) and managed to talk myself out the door Saturday morning for a run. We were staying downtown, and I happened to stumble upon the beginning of the Katy Trail Dallas -- an urban greenspace walking/riding/running path. It was a beautiful, shady path with lots of people out for runs, bike rides, and dog walks. Great peeks of the downtown skyline and neighborhoods. 2. I had a brief period of good luck with shopping at online used clothing stores, but it seems my luck has changed. Really, it comes down to not being able to return something. My last purchase -- and the one that has convinced me to stick to buying things I can try on and/or return -- was a pair of jeans. I ad tried on a really expensive pair of jeans a while back that I had liked a lot, but didn't want to spend that much money. So I started keeping an eye out for them used. I thought since I had tried them on I knew the style and size that I wanted. Well, I either didn't quite remember the style correctly, or I bought a cut that was a few years old (you know how brands will randomly adjust the cut sometimes). Anyway...don't like it. I'm going to try to resell them, but regardless, it's a lesson learned. 3. This is a really good article I read several months ago on the dangers of abandoning knowledge in Christianity in favor of a feelings-oriented faith. Both are necessary -- love the Lord with all your HEART, SOUL, MIND, and STRENGTH. 4. Since I'm home most of the time, I listen to a lot of music during the day, and really prefer picking my own stuff in the car too. I buy most of my music through Amazon, and we have Prime which gives me a bigger catalog to listen to, and I listen to Pandora a lot; but the past month or two I've been missing Spotify. I've never paid for a premium account because I always listened on a computer and you don't really need premium if that's the only way you listen. HOWEVER...I've been wishing I could use some of the premium features on my phone or on our Amazon Echo. So...I signed up for premium. Here's what I like about Spotify -- I really like the ease of making playlists. I like their algorithms for suggesting music through their Discover Weekly personalized playlist. I like that if I'm in the mood for a particular song or album I can listen to just that. I like that I can download music to my phone for offline listening. I'm thinking that after a month or two of having such a plethora (one might say redundant) of music listening options, I'll figure out what I actually use the most. 5. Just picked up Songs of Willow Frost, by Jamie Ford. It's by the author of Hotel on the Corner of Bitter and Sweet, which I liked a lot, so I have high hopes. 1. I've rediscovered a love for cutting off jeans that just aren't quite working as long pants and turning them into shorts. 2. I'm going to pass on a little librarian pro-tip: if you borrow ebooks from your library (and if you don't, you should start), one of the problems you might run into is that when they're due, they automatically expire and disappear on your reading device. HOWEVER -- if you turn off the wi-fi on your reading device, you should be able to keep reading it if you still need a little more time to finish it. This information is on my mind at the moment because I forgot to turn off the wi-fi on my Kindle and the book I was in the middle of disappeared this morning. Ahhh!!!!! (What Alice Forgot, by Lian Moriarty. And if you've ever read any of her books, you know how hard it is to stop in the middle). Sometimes, you can just go check the book right back out, but unfortunately for me, there's a wait list. Fortunately, the wait list is not too long. 3. The kids and I planted a few seeds in pots in the backyard last week. Tomatoes, cucumber, basil, rosemary. I've not ever tried tomatoes from seeds -- only seedlings -- so we'll see how it goes. 4. I'm almost done with a mini closet purge. It started when I realized it was time to try and sell my double jogging stroller. I hadn't used it in months -- the kids have gotten big enough that running with them in it is more trouble than it's worth. Anyway, I listed it on Craigslist (still hasn't sold, although I finally have someone interested to come look at it) and that inspired me to list a couple of other items that seemed worth selling and schedule a donation pickup for a big bag of clothes and purses. I love clearing out closets (much to my husbands amusement and occasional frustration), and it's even better when I can maybe make $50 in the process. 5. What I'm reading: the previously mentioned What Alice Forgot, and the mystery In a Guilded Cage by Rhys Bowen. What I'm watching: Superstore, Star Trek: Discovery (almost finished with the first season now), and the final season of The Middle (sadly, not as funny as previous seasons of this show, but time spent with the Hechs is time well spent). What I'm listening to: Dave Barnes. t Georgie is a poor aristocrat relying on her connections to get by -- something not uncommon in 1930s Great Britain. When Georgie finds herself at loose ends, she agrees to do a favor for the Dowager Duchess of Kingsdowne Place. The Dowager's oldest son refuses to marry and produce an heir, leaving the family seat in danger of dying out. When the Dowager begins a search for any living relative that could inherit, her detectives discover that her younger son -- who was killed during WWI -- had a wife and son in Australia. The Dowager sends for the previously unknown grandson, and tasks Georgie with helping Jack learn about life as the heir to a dukedom. In addition to the Dowager and the Cedric -- the oldest son and current Duke -- the Dowager's daughter Irene and her three children are also living at Kingsdowne Place, along with the Dowager's two sisters, a tutor, and some of Cedric's friends. When Cedric turns up dead not long after Jack's arrival at Kingsdowne there are plenty of suspects to choose from, and everyone is quick to point fingers (with the small exception of the Duchess' sisters, who mostly just want to throw seances every night). 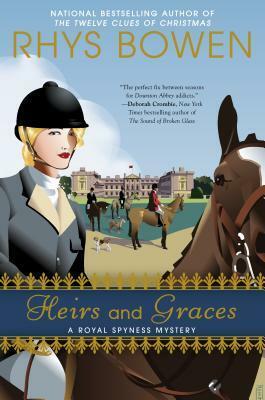 Heirs and Graces is the kind of book that begs to be read in one sitting, with a cup of tea and some shortbread biscuits. It's a solid mystery with a fun and light tone, a delightful heroine, and a vivid setting. It's the seventh in the Her Royal Spyness series, although I didn't realize that when I picked it up at a used book store. Fortunately -- although I'm sure reading the previous books would have added depth to some of the characters and relationships -- I had no problem jumping in at this point in the series. Bottom line: if you enjoy your mysteries cozy, or find yourself missing Downton Abbey, give the series a try. the stand-out, fresh, unique perspective. but tell me which bestseller it's like.